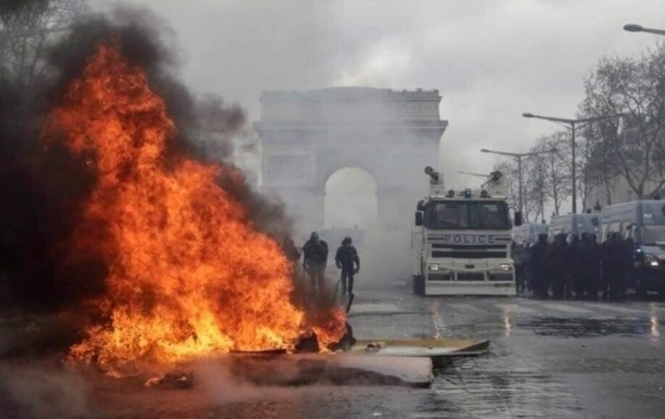 More than 200 people were arrested in Paris this weekend after Acte 18 of the gilets jaunes protests turned violent, with shops smashed, and fires lit on the Champs-Élysées. Official figures from the ministry of the Interior show that there were 32,300 protesters across France yesterday (Saturday March 16), of which 10,000 were in Paris. This means numbers were up by almost 4,000 compared to the previous weekend. In Paris, 237 people were arrested, and 200 taken into police custody. Around 60 people were reported to have been injured, including 42 protesters and 18 law enforcement officers. The Champs-Élysées and Arc de Triomphe areas were especially affected by the clashes. A bank was torched, and a number of high-profile designer stores were smashed, as was the famous restaurant Fouquet’s. Windows were broken and graffiti was daubed on the walls. Reports have suggested that 5,000 officers were faced with 1,000 “extremely violent individuals”. Police used water cannon and tear gas. Politicians have condemned the violence, which has been described as “unprecedented” since the demonstrations of December 2018. President Emmanuel Macron, who cut short his ski break to return to Paris yesterday, has said: “What happened on the Champs-Élysées, that is no longer what we call a protest. These are people who want to destoy the Republic, at the risk of the killing. All those who were there have made themselves complicit”. Eric Ciotti, MP of the Alpes-Maritimes, said that the initial gilets jaunes movement had been “completed diverted”, and was now nothing more than “a simple pretext to regroup vandals/smashers”. The gilets jaunes protests and clashes took place away from the climate change march, dubbed “La Marche du Siècle (the march of the century)”, which was judged a success as it amassed over 45,000 people in a different part of Paris. Over 350,000 people were counted as having joined the climate march movement yesterday, across 220 towns and cities in France.